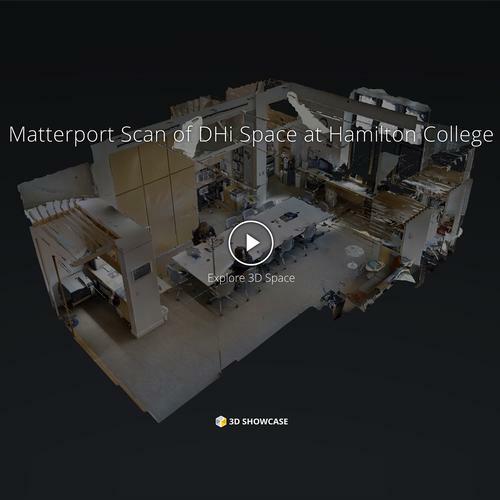 As part of DHi's expanding work in 3D and virtual reality development, our latest technology includes 3D scanning and virtual tours of real-world spaces through the use of the Matterport 3D camera and mapping software. Try our showcase of a 3D-scanned virtual DHi office! The DHi offices are a metaphor for DHi’s partnership with the humanities: housed within the traditional Beaux-Arts shell of Hamilton College’s former library in Christian Johnson Hall, on the main quad of the campus, is a state of the art collaboratory employing the latest in multimedia digital hardware and software. The collaboratory space with its reading room “ambulatory” implies this history: a “fragment” from Christian Johnson Halls original Collegiate Gothic plan is now borrowed and re-purposed for the twenty-first century. The DHi trans-disciplinary incubator is showcased to the Hamilton community immediately upon entering the CJ lobby in a portion of the former Emerson Gallery. The design team included three professional architecture firms: HMC Architects of Los Angeles and San Francisco, Rhen Design of Rochester, N.Y., and Paul Richard Foote Architectural Design of Seneca Falls, NY (with six design partners, including Nieves). The architectural team was spearheaded by P. R. Foote, of Paul Richard Foote, Architectural Design. Mr. Foote studied architecture as an undergraduate at Yale and received his M.Arch degree from Syracuse University. Retrofitting the state of the art DHi facility into a 100 year old space seemed a natural fit for him as he writes on his website, “We frankly profess our love for old buildings... along with our fascination for the ‘shock of the new.’” During his 30 year career, Mr. Foote worked at the offices of Skidmore, Owings & Merrill LLP (SOM), Washington, DC; and Charles T. Young Architects; and Chan and Mohney Architecture, both of New York City, before founding his own office in Seneca Falls, in the Finger Lakes Region of upstate New York. Other team members included architect-of record, Roseanne Hennessey, of Rhen Design, Rochester, NY and Charles Dilworth, Regional Design Director of the San Francisco office of HMC Architects. Mr. Dilworth has made design for high-tech his specialty with projects at Apple, Silicon Graphics, and 3Com. All counted, there were six design partners for the new DHi offices, not-the-least including Prof. Angel David Nieves of Hamilton, Co-Director of DHi, whose professional undergraduate training in architecture (Dr. Nieves has a B.Arch. from Syracuse University) proved invaluable to the critical evolution of the design. Construction, renovation, and furnishing have been entirely funded by internal Hamilton College resources. The budget was targeted at $125K (professional fees were extra) at a very competitive $167/SF. Contract furnishings were another $15K. The result will be a classic, yet flexible, modern signature space onto which a variety of technologies and hardware can be layered in the years to come. Here barriers to interdisciplinarity will be broken down in a singular space where faculty, students, and staff may gather to work and conference with state of the art digital resources and support. Into this space will be installed signature furniture from Knoll’s (manufacturer) iconic collections of seating and portable workstations, allowing for flexible space configurations. Further supplementing this will be custom workstations, built in seating and other cabinetry from our upstate NY cabinetmaker, fabricated at his state of the art shop. In a space of about 750 square feet, we are providing for six discrete spaces: DHi Operations, two offices, lounge, storage, and a group collaboratory space of almost 375 square feet – providing a balance of densely programmed perimeter space and generously proportioned collective main space. The DHi space is programmed for up to fifteen workstations along with three dedicated offices. The main space of the collaboratory is configured as a flexible teaching space which can be subdivided into a series of smaller research team-based clusters.